Passport Potash says they've drilled 3 core holes in their expanded potash exploration program in Arizona's Holbrook basin, and completed part of their seismic exploration lines. Meanwhile, the Arizona Oil & Gas Conservation has approved permits for an additional 11 core holes, bringing the company's total to 19. 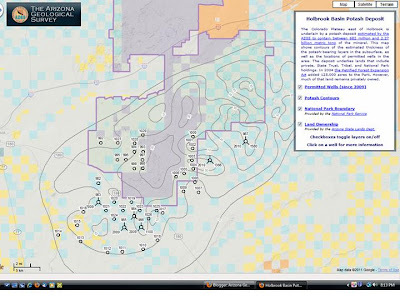 Passport announced last week that it raised $7,107,500 for exploration and drilling at its Holbrook properties in Arizona, and applied for mineral prospecting permits on 7,000 acres of federal land. There are now 38 core holes permitted in the Holbrook potash play, with HNZ Potash also having 19 core holes permitted [right, AZGS potash viewer]. Good work, AZGS, for preparing and releasing reports that show salt and potash deposits that have potential for development. Development of these valuable resources will bring much-needed revenue to the State of Arizona. Why can't a small percentage of that revenue be directed to support the operation of the AZGS? Lee, just dropping in to tell you I am enjoying your blog posts. Keep up the good work. Always an interesting topical read here! Kudos. Thanks Wayne. We're not in Kansas any more, but we try to stay in touch with many great friends and colleagues we met there. Lee..............in your opinion, what are the chances of this deposit becoming a minable resource? The USGS has completed a global assessment of potash, including ours, which is in review. We hope to see it released later this year. There has not been a new potash mine in the world in the past 30 years but there have been expansions of existing mines. New mines are being proposed in multiple countries but it's not certain any will actually be put in production. Arizona's potash will have to compete in a global market. The Holbrook basin deposit has advantages of being shallow, near major transportation, and could help meet U.S. demand as the New Mexico deposit plays out. The sense we get is that some of the largest potash or mining companies are watching to see what the current exploration program finds, and could come in with deep pockets if things look good. However, exploration drilling is just getting underway on the Arizona deposit, so it's premature to say how the resource evaluation and economics will turn out. In addition, the land situation is somewhat complicated with a national park overlying the center and perhaps thickest part of the deposit. Thanks for your insight Lee, it certainly seems as though the Arizona State gov't and the Feds would be anxious to help back a venture such as this. Some more "homegrown" potash would be great for the States....no? Lee, just wondering if you were invited/attending the Passport Potash site tour on Monday March 14th. If so, a quick oversight from you with details of your visit would be much appreciated. Many thanks!!! RC, I heard about the site visit yesterday but was not invited. Anyway, I have other commitments on the 14th.